Balsamic and Strawberries are a match made in heaven! Fresh strawberries are pickled with balsamic and vanilla, which creates a perfect topping for vanilla ice cream or a yogurt parfait. If you have tried Balsamic Strawberries, you already know that this recipe is going to be a knock-out. But for those of you NOT familiar with strawberries paired with balsamic you may be thinking–has she gone and lost her mind? While we don’t have time to debate the state of my mind, I can promise you that Balsamic Strawberries are an amazing combination of sweet and savory. Just take a look at every fancy restaurant out there. Their desserts are riddled with a balsamic glaze. Why? Because balsamic is the perfect counter balance to desserts and when reduced turns into a rich syrup. One of my all time favorite ways to eat any berries is with a glaze of balsamic reduction. It feels naughty and decadent, but is absolutely guilt free. I decided to take the balsamic glaze on berries a unique spin by creating a pickling liquid with balsamic vinegar, maple syrup and vanilla beans. And I must say, I struck gold with this balsamic vanilla syrup for strawberries. You guys, imagine a sweet strawberry bursting with a rich maple vanilla flavor and finishing with a rich balsamic tang– It is sheer perfection. Pickling strawberries can be done quickly. In order to pickle strawberries–or anything, you need sugar, vinegar, and salt. You can also can your pickled strawberries to enjoy strawberries year round as well. I have included both a quick pickle and traditional canning recipe. Bring balsamic vinegar, water, maple syrup, salt and vanilla bean to a boil. If using vanilla extract, mix in AFTER cooking syrup. Once mixture has come to a boil and salt has dissolved, remove from heat. Place strawberries in heat proof 1 quart jar. Pour liquid over strawberries and place lid on jar. Allow to cool and refrigerate for up to 7 days. Start with sterilized pint size jars. Prepare balsamic strawberries as directed. After the strawberries are prepared, place the jar(s) in a pot of boiling water. When the water comes back to a boil, set the timer for 5 minutes and remove the jar immediately. Make sure the lids on the jars pop down, to be fully sealed. These balsamic strawberries will last 1 year on shelf, but I find best within 6 months. 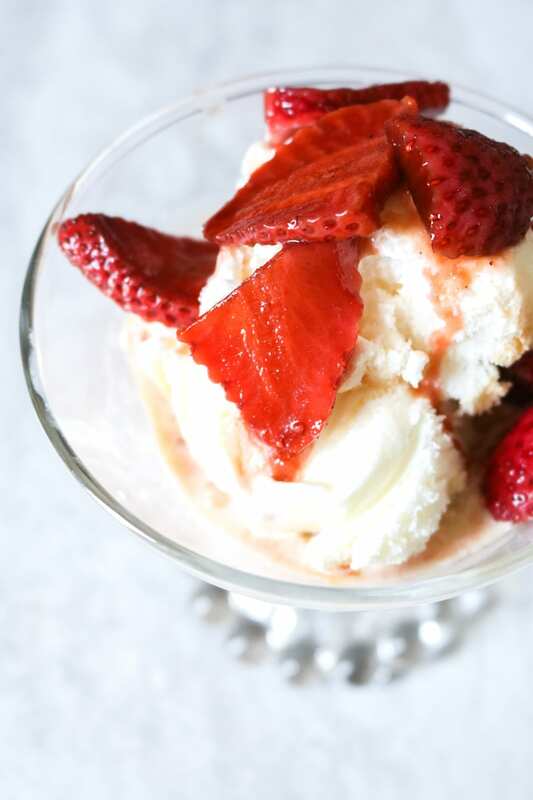 Top vanilla ice cream with these sweet balsamic strawberries. 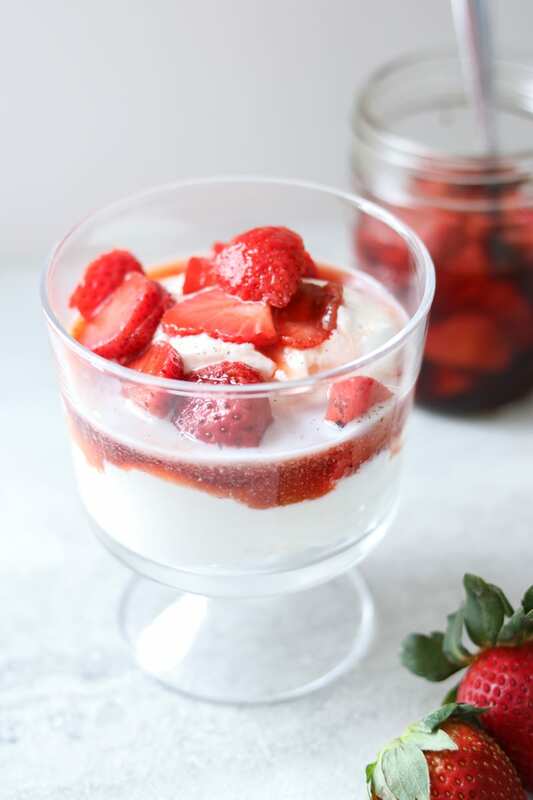 Top plain Greek yogurt with the strawberries. Use as topping for pancakes or waffles. Bring balsamic vinegar, water, maple syrup, salt and vanilla bean to a boil. (If using vanilla extract, mix in AFTER cooking syrup.) Once mixture has come to a boil and salt has dissolved, remove from heat. Place strawberries in heat proof 1 quart jar. Pour liquid over strawberries and place lid on jar. Allow to cool and refrigerate for up to 7 days. If you formally can these, they will last for 6 months. or longer storage, place the jar(s) in a boiling pot of water. When the water comes back to a boil, set the timer for 5 minutes and remove the jar immediately. Make sure the lid pop down, to be fully sealed. They will last 1 year on shelf, but I find best within 6 months. Nutrition facts are for entire quart of strawberries--which is about 10 servings. All these pickled strawberry recipes look so amazing!! I can’t wait to try yours. Over ice cream no less. YUM! It is the perfect topping! Now I’m dying to pickle some strawberries! So yummy!! Liz, it is a MUST try! Kristen, what a brilliant idea these balsamic-pickled-strawberries are! 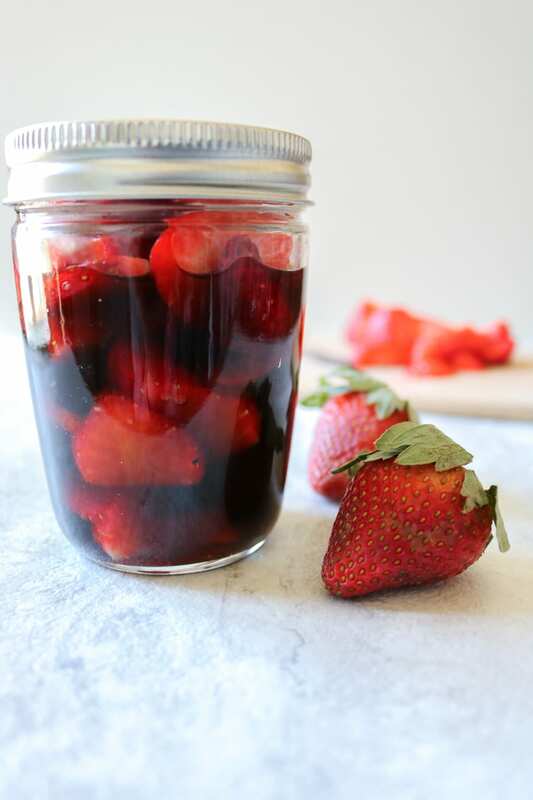 I’ve never used or had or thought of having strawberries that were pickled in balsamic – but I can so imagine all those flavors jiving – thanks so much for the inspiration and happy Monday to ya! Thank you Shashi!! I hope you give them a try! They are quite tasty! Using maple syrup sounds like a great idea! I’ll have to try it that way! This sweet tangy combo sounds amazing. I’m loving the pickled strawberries! Such a great contrast in flavors! I am traveling up to my mom’s house this week. I haven’t been home in a couple of years. I live in Houston, Texas and my mom lives in Nova Scotia, Canada. We were talking about we are going to do this week, and on my list is learn how to make strawberry jam. Then we got on to the topic of pickling. I’ve only ever pickled a black-truffle, that I was very lucky to recieve as a gift earlier this year. I am excited to try this recipe. The strawberries just came into season last week and we are going to give this recipe a go. I just discovered your blog. Looks good. Thanks for the recipe. Hi Troy! Wow! What a trip! I hope you enjoy the gorgeous scenery and time with your mom in Canada.